visiting Junction Earthworks, Fort Hill and Serpent Mound. This trail winds its way up a steep hillside via several switchbacks. The elevation gain and the extremely rocky terrain may be challenging. The base of the sheltered moist hillside is rich in Yellow Buckeyes and wildflowers, including the Golden Star Lily; and is carpeted with lush mosses and tall ferns. Here black birch, a relatively uncommon tree in Ohio, grows abundantly. The higher elevations boast oak and hickory trees over 200 years old, the trees bearing impressive girths. This trail traverses Rocky Fork’s floodplain, a tributary of Scioto Brush Creek. Wildflowers are extremely rich on this trail, the Golden Star Lily being among them. White Walnut, or Butternut, has declined in our forests due to disease but still grows in small numbers along the edge fo the Rocky Fork. Look for its pied black & white bark. Watch your footing on the rock-strewn portions of this trail. The Golden Star Lilies need your eyes and ears! The Golden Star Lily is an extremely rare plant throughout its range and endangered in Ohio. To be able to continue opening the preserve’s doors to the public, we need to keep the Golden Star Lily’s populations safe and secure. If you see anyone harvesting any native plants or violating any other preserve regulations, please report the incident. Call or text the Arc at 937-365-1935 and include the license plate number if you have it. Your caring presence is a strong deterrent. Thank you for your stewardship. From the Appalachian Highway, Rt. 32, just east of Peebles, turn south on SR 73 12.2 miles through Rarden to the little town of Otway, Ohio. 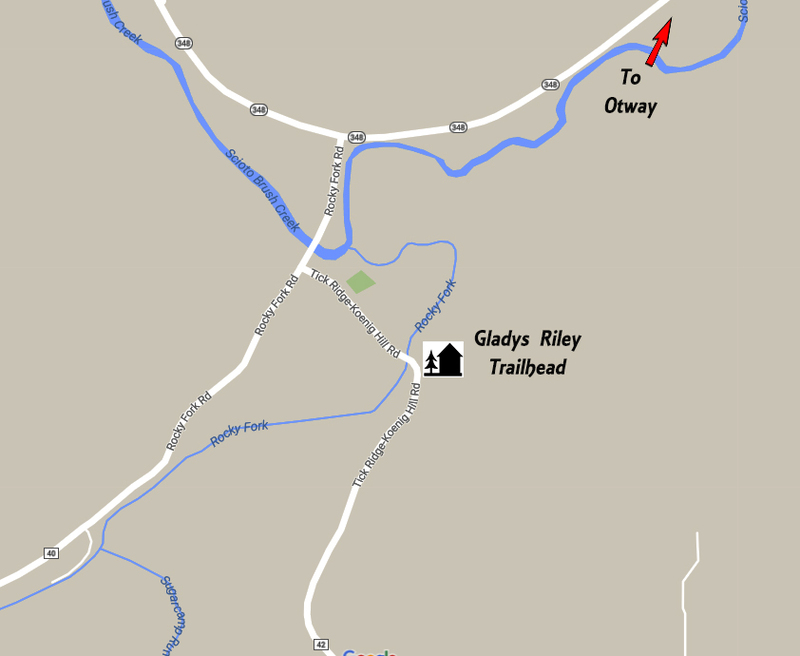 In the middle of Otway, turn right or south on SR 348 for 1.1 miles. Turn left on Rocky Fork Road for just .2 miles, and then turn left on Tick Ridge-Koenig Road for another .2 miles. Just after you cross over the Rocky Fork Bridge, the gravel trailhead parking lot will be on your left. It is signed. 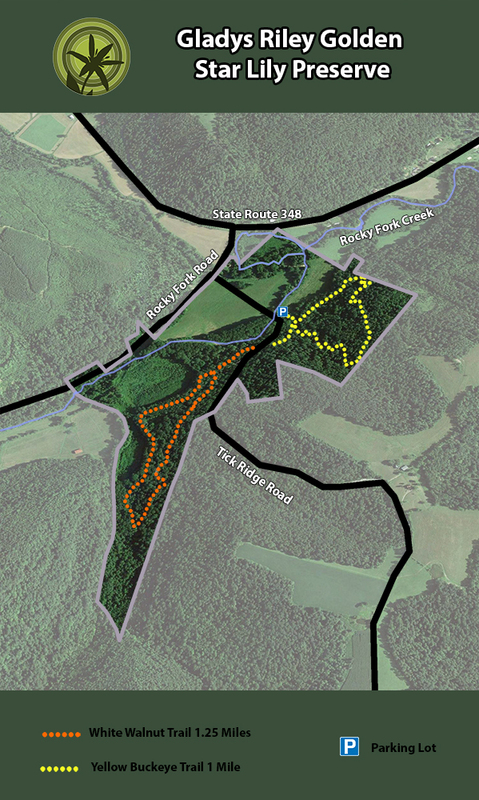 Please note that Tick Ridge-Koenig Road is semi-circular and has two entrances on Rocky Fork Road. Coming out of Otway, be sure to make the first turn.